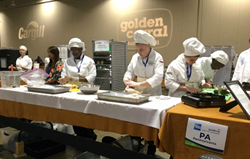 “We are so proud of our students and how calmly they acted throughout the competition," said Samantha Katzaman, a Culinary Arts Teacher at MHS. Milton Hershey School® students recently traveled to Dallas, Texas to compete in the 15th annual National ProStart Invitational, the country’s premier high school competition focused on restaurant management and culinary arts. During the national competition, more than 350 students from across the country came together to showcase their culinary skills in front of industry leaders, including corporations, colleges and universities. The MHS culinary team worked together to test their teamwork, workplace communication and culinary skills. The group of students successfully created a three-course meal in under an hour using only two butane burners. The MHS culinary team was invited to attend the three-day event after winning Pennsylvania’s ProStart Culinary Invitational for the second year in a row in February. The Culinary Arts/Restaurant Management Services career field is one of 11 pathways offered in the MHS Career and Technical Education program. In the last four years, 100 percent of high school seniors graduated with at least one industry-recognized certification. Learn more about the school’s Career and Technical Education program at mhskids.org.